During this two day trip from Boston, you’ll explore the Niagara Falls and the Thousand Islands through a series of actives including Maid of the Mist, Thundering Water Cultural Show, Old Fort Niagara, Niagara Falls Illumination, and a Thousand Islands Cruise! The tour will depart early in the morning for Niagara Falls. Your first stop is Old Fort Niagara and its pivotal location at the mouth of the Niagara River. Watch the optional "Old Fort Niagara Falls History” movie, and you will understand its central nature to the struggles between the French, British, and Iroquois. Around 4:30pm, your tour will arrive at the Maid of Mist, where you will take an optional half hour boat ride on the famous Maid of the Mist. Experience the closeness of the waterfall and get soaked! The Maid of the Mist has been offering its service since 1846. 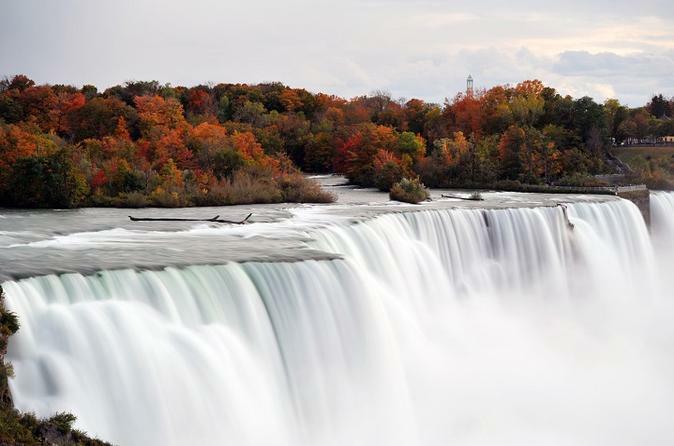 Since then, millions of visitors have enjoyed the magnificence and thrill of the Falls. There, you will be given plenty of time to explore the mysterious Niagara Falls yourself. Other optional activities include a Niagara Adventure movie and Thundering Water Cultural Show. End the day on Goat Island to take in the impressive Niagara Falls Illumination of the American and Horseshoe falls. After a relaxing night stay at your hotel in the Niagara Falls area, your group will depart in the morning to visit the Thousand Islands. You’ll have the option of a fun and educational cruise ride on the Thousand Islands to see the islands of Alexandria Bay up close. From the incredible Bolt Castle to the mysterious Deer Island, there is much to explore! After enjoying the day, your tour will return to Boston. Note that during the winter time, the optional Maid of Mist and Thousand Island cruises are unavailable, and will be substituted by a visit to the Corning Museum of Glass and a 45-minute Jet Boat Ride along the Niagara Gorge. Admissions are not included to any optional activities during the trip and will be paid onsite.